You will be missed… President Gordon B. Hinckley – It Works For Bobbi! 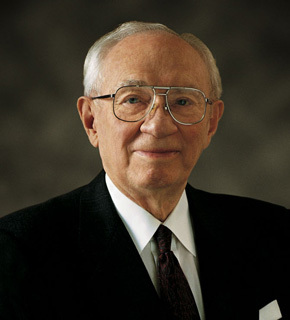 Published on January 29, 2008 August 9, 2016 by Bobbi-Jo G.
As many, if not all, of you already know, our beloved prophet President Gordon B. Hinckley passed away peacefully at the age of 97 on Sunday evening. My mother phoned to tell me the news, and my first reaction was one of sadness, followed quickly by a feeling of joy so full that it brought tears to my eyes much faster than sorrow could have. I have always believed in the reality of eternal families, and the knowledge that I have that Pres. Hinckley had passed through the veil and was now reunited with his sweetheart, Marjorie, made my heart full. He was president of the Church for most of my life, and for that reason among others, he will hold a very significant place in my heart forever. His humility, his humor, his unfailing love for all mankind will be an example that will live forever in the hearts of those who loved him. Here was a man who lived his life in the service of others, with no thought for reward. He served faithfully and earnestly until the age of 97 years. How I hope I can endure well for that long! I have no doubt that he has gone on to his eternal reward and that now we must move on and move forward. I am so happy in the knowledge as well that there will be no lobbying to be the next prophet, there will be no contentions over rank. Amazingly in today’s society, in the midst of the US Presidential elections, there is such a stark contrast in the how the Lord does things. If you want to read details on the Succession in the first presidency and how it works you can read HERE. I am filled with peace and joy to know that Jesus Christ does live, that He has established His church on the earth. It is here! He has prophets and apostles on earth today, guiding and directing us. What time in the history of the world has needed them more? I know that the Book of Mormon and the Bible are true accounts. How do I know this? Through careful study and much pondering and personal prayer. My testimony is something that is precious to me, and I find it hard to share it for that reason. I worry about being mocked, the things I hold most sacred being considered as naught. And yet I can not deny the things that I know to be true, and my heart bursts to shout it from the rooftops! I try to live what I believe, and being witness to the incredible and enduring example of Pres. Hinckley serves as a motivation for me to endure to the end. To find joy along the way, and serve with a smile! I love him dearly, as do millions of others around the world, and now my thoughts and prayer are with the Quorum of the 12 as they face many changes. If you are not familiar with my faith, you can find out more by visiting http://www.mormon.org/. Beautiful testimony and tribute Bobbi. Thanks for being sweet enough to share it with the rest of us. This is awesome Bobbi. Thanks!